Cardano USD market goes live on U.S.-based Bittrex exchange. ADA/USD ignores the new support, declines continued towards the resistance turned support at $0.10. Bittrex exchange is today September 5 adding US dollar (USD markets for both Cardano (ADA) and Zcash (ZEC). The exchange is based in the United States and offers its customer real-time trading while guaranteeing highest security in the industry. The exchange had communicated earlier that all the eligible trading accounts that were opened in August have been enabled for trading. The details and instructions for deposits and withdrawals are available on Bittrex website, support page. 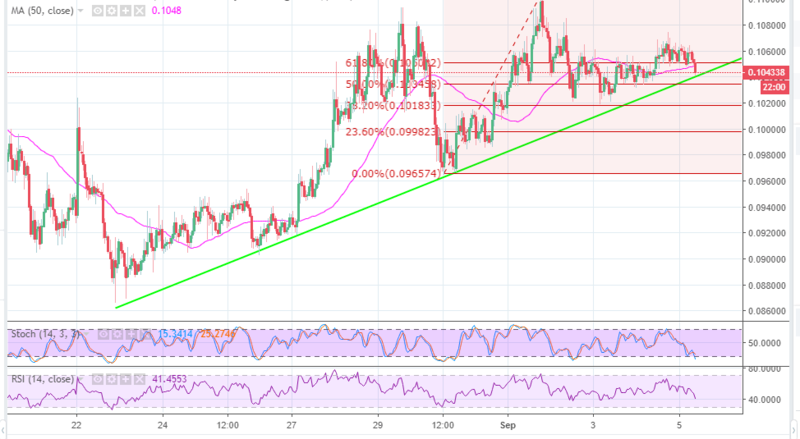 Cardano has maintained trading above the trendline initiated after the drop on August 18. The retracement cleared the resistance at $0.10 and traded September highs at $0.1103. There was a significant struggle at $0.1 and $0.104 (current support) but a breakout could not be sustained towards $0.112. At the moment, ADA/USD is seeking support above the resistance turned support level at $0.10. The trendline support at $0.1039 is likely to give in to the ongoing bear corrections. The support on Bittrex appears to have been ignored. Cardano must maintain the support above $0.10 to stay away from another dip towards $0.09. The path of least resistance is to the south, at least for now. The upside is limited by the 50 SMA and the upper supply zone at $0.1103.